KYOTO - At Kimchi no Mizuno, staff regularly play a game with the tables, an ever-changing dance with the room, performed to get around the fact that the restaurant is noticeably small, with space for no more than half a dozen tables. Despite the restaurant’s size, there is usually a queue that stretches outside the door and beyond, especially at lunch. So to accommodate their devoted customers, staff separate and shuffle the tables around the room as each one is vacated. While there might not be room when you arrive, room will be made. Mizuno is a family enterprise and three generations ferry dishes between the kitchen and the front of house. The restaurant has the easy familiarity of a family-run establishment and the end result is both simple and unfussy: The focus is on the food. Although the lunch menu is much narrower than the evening’s, the restaurant is busiest during the day and, unless you’re one of the first few through the door when the shutter comes up, you’ll be lining up with the rest of the late-comers. The restaurant’s main draw is its two lunch sets, both of which are priced at ¥1,000. 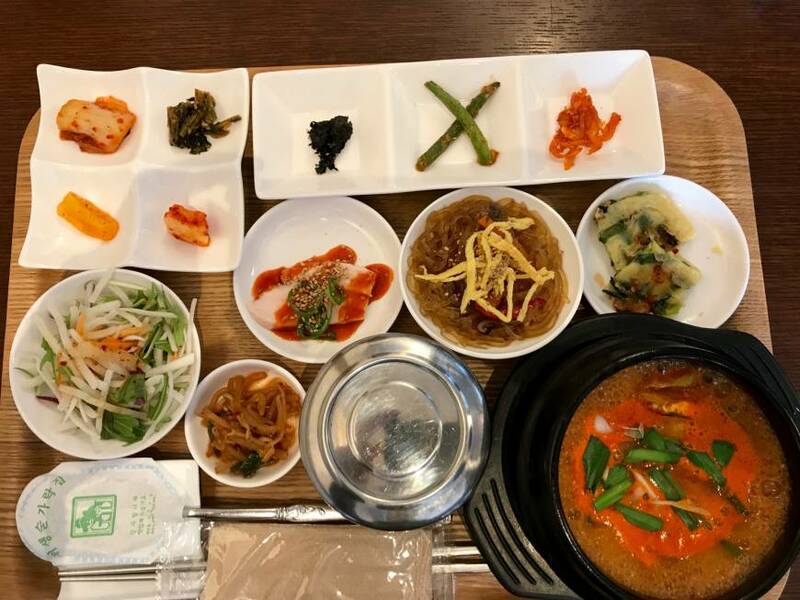 Pick between the samgyetang and the kimchi jjigae sets, both of which are based around a different main dish that comes in the form of a soup (or stew depending on whom you ask). The former is chicken-based, while the latter is, as its name suggests, based on kimchi. The kimchi at Mizuno is a family recipe that came from South Korea and has been handed down through generations. Although the Mizunos source most of their ingredients from Korea, the kimchi recipe has evolved and the spices are toned down to cater to a local audience. The end result is excellent. They sell small packs of the their original blend, as well as cucumber and radish kimchi for takeaway. Having observed my neighbors meals, most customers seem set on the samgyetang. We ordered both. Barring the main dish, the lunch sets are almost identical. They arrive on wide trays, filled with Korean staples: japchae noodles, kimchi, dried seaweed, salad and chijimi pancakes. 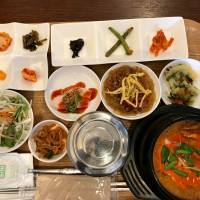 The samgyetang soup is hearty and is supposed to boost the immune system. The recipe starts with a whole chicken that is then stuffed with ginger, garlic, ginseng, jujube dates and rice and left to simmer. For lunch, the portion you receive is just a piece of the whole but for dinner you can order the full chicken, which takes both time and skill to pick through. The kimchi jjigae is a more vegetable-based affair. The main ingredient is aged kimchi, into which cabbage, tofu, red peppers and sometimes gochuchang — a thick red chilli paste — is folded. The spiciness of the dish sneaks up on you, a slow simmer that develops into a harsh burn that will leave you reaching for the water. Both sets are filling and give a great, if brief, whirl through some of the highlights of Korean food. But for a deeper dive, you’ll have to come back in the evening. 11:30 a.m.-2 p.m., 6:30 p.m.-10:30 p.m.